Fans of NBC’s The Office, consider this fair warning. 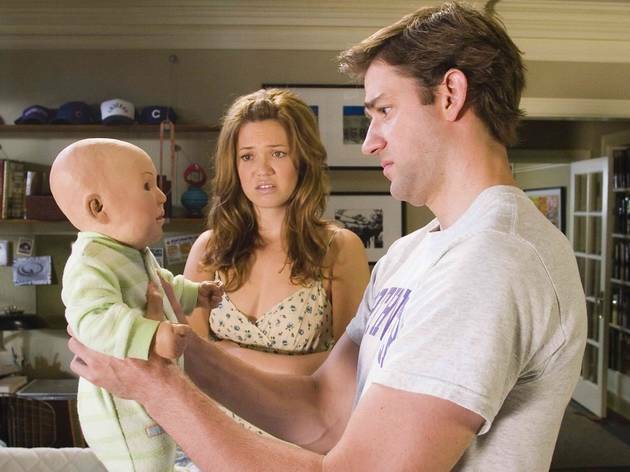 Even though the TV show’s everyman hunk John Krasinski stars in this matrimonial farce (alongside several of his Office mates) and director Ken Kwapis has helmed a few episodes of the series, don’t expect this bland romantic comedy to share any of the program’s sensibilities. If anything, License to Wed epitomizes the sort of toothless, ready-for-prime-time humor that the stellar sitcom subverts on a weekly basis. After meeting cute at a Starbucks, Ben (Krasinski) and Sadie (Moore) are destined for couplehood; a marriage proposal is naturally just one dating montage away. But before getting to marital bliss, the twosome has to pass through a relationship-strengthening course run by Reverend Frank (Williams), who’s hell-bent on breaking up the lovebirds before they can walk down the aisle. It’s bad enough that Krasinski is essentially asked to reprise a flavorless version of his small-screen persona, or that Williams, toning down the manic shtick for once, does nothing but offer bumper-sticker platitudes about listening to your spouse, yadda yadda yadda. But add a lot of musty, Eisenhower-era gags (most women are shrewish ballbusters! all fat people love food!) and you wonder why the producers didn’t just throw in canned laughter as well.